“I’d read the whole Narnia series when I was young and I loved it,” David Magee explained. 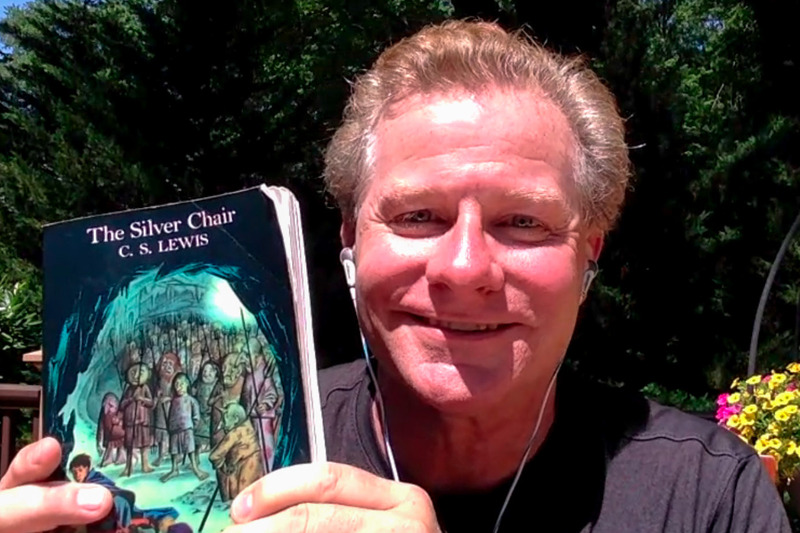 The Oscar-nominated screenwriter joined us remotely from his office in New Jersey to chat about his script for The Chronicles of Narnia: The Silver Chair movie. Listen to the interview below or read the transcript. David discussed key scenes in the book/movie, his collaboration with Director Joe Johnston and Producer Douglas Gresham, elements of The Silver Chair that may be expanded for the movie, and a lot more. He also said he hopes to be involved with future Chronicles of Narnia movies. The C.S. Lewis Minute segment is brought to you by William O’Flaherty from EssentialCSLewis.com. Check out more episodes of Talking Beasts: The Narnia Podcast and keep up with the latest Narnia movie news. Terrific interview. Thanks David Magee for giving it! I especially liked how he addressed Jill as a bullied girl. Great interview. Really appreciate David taking the time to do this. I loved this! Thanks for this great interview. It definitely makes my excitement for the film increase. SC is my favorite book … And the last film adaptation was in most ways a big disappointment. Sounds like I have reason for lots of optimism about the adaptation of The Silver Chair. I should say VODT film. Not the BBC SC version. This just confirms my belief that Magee was the perfect choice for this film. Thanks for conducting the interview, Gp, and for agreeing to it, Mr. Magee. I’m still pretty apprehensive about how the movie will turn out. He seems alright and everything, but the fact he "read the books and liked them" made me sad. I want someone that read the books until the pages were worn. And I have to keep coming back to it – the bullying. The story isn’t about that, it is about consequences. The bullying is just a tool in the story to show how much Jill has grown by the end. I may sound nuts for a 40 year old but these stories are so very important to me, to who I am at my very core, and to my art… I can’t be the only one that feels this strongly about them. I too was uneasy about the idea of bullying being emphasized, so this interview made me feel a lot better. The themes he talked about initially had nothing to do with bullying. It’s only when I specifically asked him about it that he bothered talk about bullying at all. And all he said is that we will know specifically what Jill is being bullied about in the movie. This strikes me as very similar to how they elaborated on the World War II context in the LWW movie. It’s just part of adapting the book into a three-dimensional flesh-and-blood world. Obviously we know very little at this stage and my concerns aren’t 100% gone. But, this interview was encouraging. You are most definitely not the only one who feels that strongly about the books! I’m 30 and the books literally changed my life, and I continue to find new meaning ever time I go back. I’m really glad you are here! The filmmakers need to understand that there are a lot of people who don’t just want to be entertained…. the book means more to us than that. Please continue to speak out. Yes, I’m sure that the book David Magee was holding was dog-eared. Whilst I went through the Silver Chair Reading Group Chapter by Chapter, I was carrying around a copy of that book to read at odd moments, at the Doctor, on the bus, on a train, leaving it lying around the house etc. I’d imagine that whilst he was writing a script of a film he would be doing the same sort of thing, referring back to the book again and again. It is easy to get tripped up if a question arises that the reader had not noticed at last time of reading, no matter how well one thinks they know how the book goes. Thank you, I did feel a bit better, but yea… still not there either. Just a note, he actually says "I’d read the whole Narnia series when I was young, and I loved it." Like and love are a little different, and he finished the whole series. I definitely feel optimistic. I saw Finding Neverland last year and I thought it was a really great film. I’m really glad that Puddlegulm’s speech is going to b in the movie. I’m just hoping that Aslan’s speech he gives to Jill will be in there because that’s my favorite scene in the book. This was fabulous! Thanks to GP and David for putting together a great interview! Haven’t been this excited about Narnia news since the Joe Johnston video in April. What I really don’t want to see in the movie is the part where they sliced off the snake’s head and I’m sure kids don’t wanna see that either. Same! I don’t mind a quick beheading shot, but not the hacking off with repeated blows described in the book or the "nasty mess." Gut instinct: I’d like them to stick to the book on this one. It feels right that her defeat be violent and nasty. So long as at the end Prince Rilian gets his line, that he would not have wanted to have killed her as a woman. Maybe they can just have the camera up and not show the head Being Sliced off. Just finished my second listen, and I am so excited! Great interview, Glumpuddle, and thanks to all who had a hand in setting this up. I was beginning to feel depressed by the silence, and this episode and the the podcasts in general always make me feel better. Mr. Magee seems to have a good grasp of the story, but still able to admit what changes need to be made. I began to understand the silence a little more as he talked about collaboration. It made me realize that as more people are brought on board they will have their own creative input, and the pause can in part be explained by them all working to get on the same page. I’ve just listened to it for the first time, and yes, I’m thrilled, too. It is great that Glumpuddle was able to interview David Magee for us. Has anyone seen "The life of Pi"? It was a really good film and very thought-provoking. I particularly loved the ending of that film, and now as a consequence of this interview, I feel reassured that I may feel the same about Silver Chair. You’re a great interviewer Puddleglum! Thanks for your thoughtfully chosen questions.You’re a great answerer Magee! Thanks for your encouraging answers. Very good. Just a question: who would you guys like to see compose the music for Silver Chair? The same guy as the first two films. Harry Gregson-Williams, I believe? This interview made me happy. I have a good feeling about this one, guys. Also, Glumpuddle, notice how he said "optimism from the most pessimistic of characters." Not sure if that goes along with what are always saying about Puddleglum or if it is the opposite. I quite liked it. My concern with that comment was that Puddleglum isn’t actually pessimistic at all. He’s quite the opposite. He always puts what he considers to be a positive spin on it. The humor is that to others it doesn’t actually sound optimistic. I just hope they don’t make him into Eeyore. Good news if not great news. It would seem David Magee has a complete grasp of the novel and the messages it contains. Sounds like it is going to be a very intelligent script. I do not have the same fears for this movie that I had for TVOTDT which was a massive opportunity lost to produce a powerful, thought provoking yet entertaining film. Excellent interview. I am a little more at ease about the film. I am still uncomfortable about Mr. Magee wanting to name TLOTGK, a very bad idea. I am glad that he wants to stay close to the book. The studio has a final say about this. He did not say anything about a battle. I am still guarded about the film. Great job, Brian. A few months ago someone asked Magee on Twitter about the lotgk having a name and he said "We have not given her a name as of yet and might not use any name in the dialogue " So it seems like there’s a good chance she won’t have one after all. Thank you for the information. This makes me a little more comfortable. I went back and watched the creative spark video from 2015, and someone in the comments pointed out that you can see "The Silver Chair" sitting on his table at 2:26. I looks like the same copy he has in the above picture. Just a fun little nod to Narnia. Thank you so much to Mr. Magee for taking the time to do this and for giving such thoughtful answers. I really appreciate his insights. Go show him some love on Twitter! Also, awesome job Brian! It was a great interview. I’m definitely more at ease about the bullying thing now. And really, everything he said was very encouraging. Thanks to David Magee for doing the interview! I appreciate how much the production team has been invested this time around in reaching out to the fan base. I am looking forward to this movie even more after listening to the interview! Like his hint about the bullying! Loved it! I am so hyped for this movie right now! From what Magee said it sounds like they are on the right track. I really appreciated what he had to say about adaptation. It helped me understand what goes on in movie makers’ heads. Good job everyone! Liked the interview – hopefully he sticks a bit closer than previous films, especially the last one which was sadly butchered almost beyond recognition. Certainly willing to wait and give them the benefit of the doubt. Stoked I guessed the trivia question correctly, although it was nice to hear Magee thinking through it and doing a good job eliminating obvious wrong choices – it tells me he has at least a working knowledge of the books, which certainly can’t hurt. wow that’s nice.He indeed is putting all the efforts. Having hopes that he will make it nice for both the book readers and the other audiences .Hope the begin cast and filming within this year !! -Jill had a fear of dark, closed spaces, right? I guess that fear should be a bit explored in the movie because thats one of her fears. Yeah, I’m starting to think the same thing now. I listened all the way through and I am glad he was one of us kids who read and loved the Chronicles. I feel the script is in safe hands.